Rick Henderson fashions editorial commentary for the Rocky Mountain News and is a self-described ink-stained wretch; alumnus of UNC-Chapel Hill; aficionado of American roots music (Blues, man, Blues); eclectic pop culture; and a cheap wine snob. That last bit is a stretch, Rick is on a very short list of actual wine connoisseurs. And now, here's Rick, Guest Blogger de jour (insert sound of applause here). When I go wine tasting these days, I feel more like I'm in a fantasy baseball league -- increasingly obsessed with numbers, mainly alcohol levels. Sad to say, too many domestic wineries are pumping up the alcohol content to either a) attract novice drinkers who used to buy wine coolers or b) (allegedly) get the attention of writers like Robert Parker, who prefer big fruit (and who attract lots of customers to the wines they praise). Me, I prefer fruit and structure. If I want to get hammered, Jack Daniels does fine, and is easier to nurse than a cab. If I want to drink something sweet, Dr. Pepper is $3 a 12-pack at Safeway. I also like wine that doesn't overpower whatever I'm eating. And I like wine. Several glasses. I don't want to be bombed after drinking a couple. So, much to my chagrin, many Paso Robles vintners (even the better ones) have chased the trend. Or maybe they started it. Whatever. I'm a lot more selective about what I try there. Since there are more than 100 wineries in the Paso Growers' Association, you can be choosy. Paso growers raise a boatload of cab and chardonnay. They're probably best known for zins (see BIIIG below), but I also enjoy the Rhone varietals, especially syrah and grenache. I've seen primo winemakers there (OK, Adelaida and Norman) offer reds that have 16+% alcohol. That's almost jam. Or port. Or Ripple, depending on what 'hood you hang in with your peeps. Too hot for me. Justin's even pushing the envelope, and they ain't cheap. In my wine closet I have a petite sirah from Tobin James that is 15.6%. Yikes. That's about three percentage points too many. The defining feature of Paso reds: They're BIIIG. The technical reason is, in the words of the owner of the late, lamented Las Vegas Wine & Spirits Co., It's so damn hot there. It's not unusual for temps to hit 105 in the summer. But because the ocean is 20 miles away, it can drop to the 40s at night. Last Saturday (October 21), the high was 87 and the low was 39. Temecula doesn't get that chilly as a matter of course, which is why I think Paso is far above Temecula in relative quality. Other than a Hart cab or two, I've never had a Temecula red that can match the balance of a decent Paso wine. It's too damn hot in the Southland. The good cabs have hints of blackberry and chocolate; the zins and syrahs a touch of pepper or cinammon and berry (raspberry, blueberry). When the Paso people get it right, the combination of fruit plus structure plus price (often $15-20) is hard to beat. With care, you can hit the sweet spot, if you will, with higher alcohol than I normally prefer. One place that does is Dover Canyon. 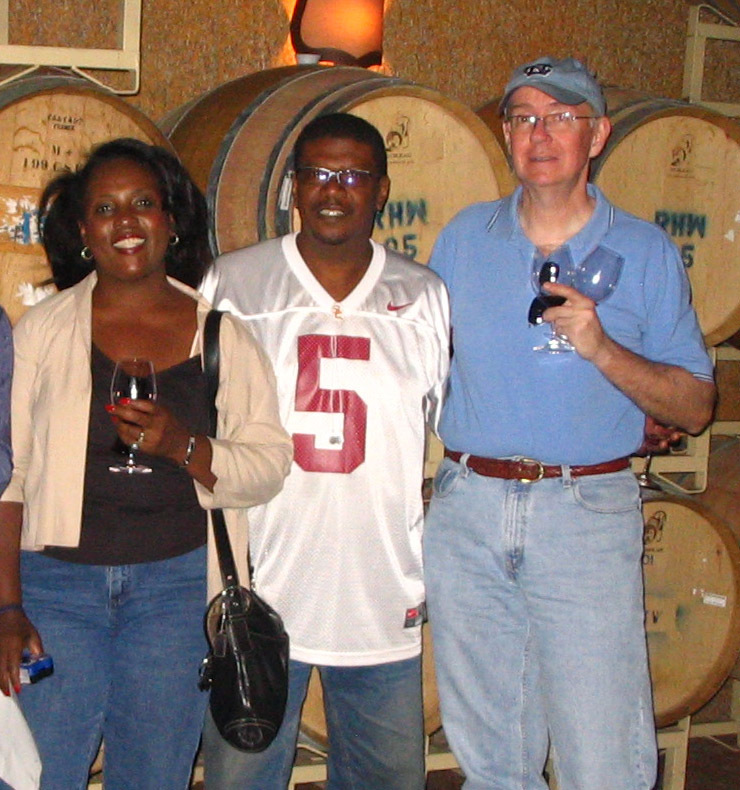 I've been a wine club member since the first time I visited in 1998. Mary Baker and Dan Panico are good people who make terrific wines. Dover's zins and syrahs reach the mid-15s on occasion; but you can put them away for a few years and they get better. Or open them now. The grenache with grilled salmon ... wow. 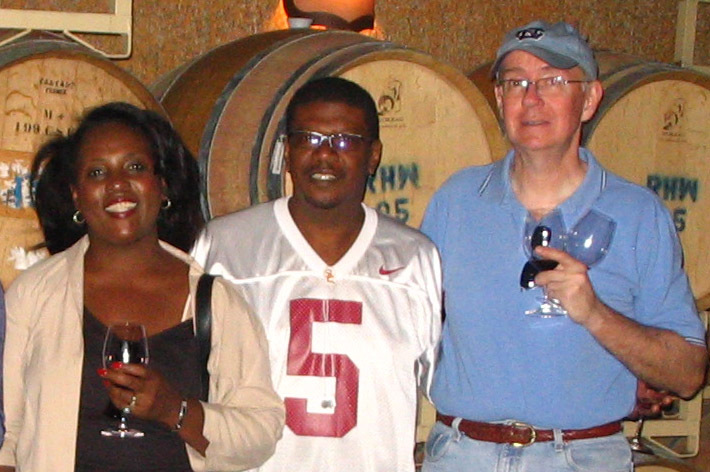 I've enjoyed everything I've had there -- even (Mike, cover your eyes) the viognier and rousanne. Dover has almost no retail presence, so you've gotta order online or visit the winery. If you go, tell Mary hi; she's a fascinating blogger, has written a cookbook, and grills some terrific lamb on the festival weekends, on the Weber kettle of course. A few of the producers continue to hold the line on the alcohol and make tasty stuff. My next-favorite Paso place is Fratelli Perata. They sell no wine before its time (literally) and encourage you to set their latest vintage aside until it's ready. While many places are offering 2004/05 vintages, Fratelli Perata's current releases include '00s, '01s and '02s. These are exquisite wines that will not break the bank -- most in the $20 range or less. Last weekend we fortunate club members got to sample bottles from the library -- cabs from '88, '93 (mmm), '95 etc., an amazing '96 zin and several lovely blends from a decade or so ago. Even the '88 still had plenty of life. Check 'em out. My latest discovery is Caparone. You may have seen their wines in Trader Joe's. Not anymore, apparently, so they're trying to get more people to the tasting room. These folks specialize in Italian varietals -- nebbiolo, sangiovese and aglianico (one of the handful of U.S. producers of this one). Great prices -- under $15 per. Alcohol levels in the 13s. Lovely, food-friendly wines. Their zin's a bit reserved for Paso, and I'm not as impressed with their cab and merlot. But the Italian reds are terrific -- and should hold up for awhile. Among the large, theme park-like tasting rooms, Castoro Cellars continues to make dam fine wine and keep the alcohol in the 13s and 14s. It's one of the few places that produces tempranillo, and does a nice job, too. The 2004 syrah is begging for a serving of tri tip or grilled pork. Excellent zins as well. Another big producer that's kept the quality high and booze levels low is Robert Hall. If you want a Rhone/GSM blend, their Rhone de Robles is outstanding. A wonderful marriage of fruit and spice. The 2004 merlot might even meet TWC's exacting standards. Then there's J. Lohr. They produce the most affordable ready-to-drink cabs from Paso -- the Seven Oaks Cab, often for $10-12 at places like Cost Plus World Market or Costco. Spend a few buck more for the Hilltop Cab and savor. For a massive operation, they do good work. EOS and Meridian, not so much. Editors Note: Seven Oaks was once the House Wine at Casa de las Rocas Grande but, alas, like all wine, the price went up. If you're a numbers geek like me, it's possible to research the wineries before you visit an see what they make and how blasted you'll get after a few pours. As Homer Simpson said, the Internet is on computers now, so check these places out. And remember, drink responsibly. Stay in school. Don't do drugs.